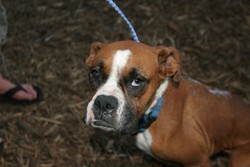 Tulip was a sweet 2-year-old boxer that had an awful life before she was rescued by ABR and she had the scars to prove it. She had old wounds all over her head and legs that were consistent with a dog that had been in many fights. In addition to that, she had a long scar that went from her neck and followed her spine all the way down her back. Because of her condition, we suspected she would be dog-aggressive, but she turned out to be quite the opposite. Upon meeting her first canine friends in rescue she was very fearful and cowarded away from them. When they attempted to play with her, she would find the farthest corner from other dogs and go curl up in it in terror. It was a slow progression, but she did come out of her shell a tiny bit to interact with the other dogs before she became ill. Her disease manifested as kennel cough, so we believed that was the only thing wrong with her at that time. One week into the suspected kennel cough she started to take a downhill plummet. She quit eating an drinking, because lethargic, and continued to cough constantly. She had been on antibiotics for a week and her foster mom increased her antibiotics 3-fold and began giving her fluids under her skin to keep her hydrated. Three days after her plummet, she was found deceased in her foster mom’s bedroom. Her foster mom was heartsick and distraught, but with her extensive knowledge of kennel cough, she knew this was something of a much greater caliber. Tulip’s little body was sent to have an autopsy to determine what the actual cause was of all her suffering. In the end it turned out to be extreme case of heartworms. Ironically, it wasn’t the worms in her heart that had caused the most damage. Her heartworms reproduce their babies, called microfilaria, and were found swimming around in the bloodstream. Poor little Tulip was infested with so many microfilaria, they were literally causing liver and lung damage in her body. Tulip spent a whopping 3 weeks in rescue before she passed away. With the vast number of microfilaria residing in her bloodstream, she was doomed before she ever made it to rescue. Even with heartworm treatment, she would have suffered the same fate. Please let Tulip’s life and death be a lesson to all about the harsh and sometimes lethal effects of heartworm disease on dogs. For more information about heartworms, please visit our FAQ page soon or discuss it with your veterinarian.